Our professional design and printing skills also allow us to produce and offer for purchase beautiful bespoke designed wedding table seating plans. 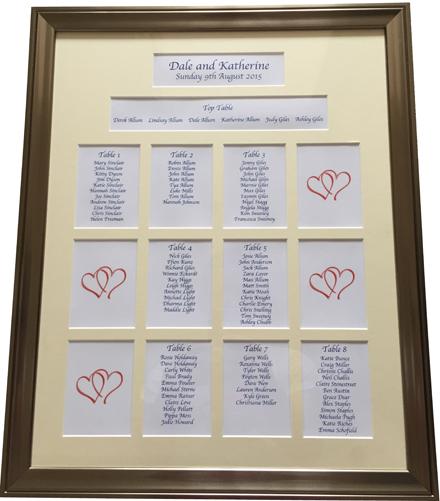 Have a stunning table plan for your wedding reception produced with framed and mounted table layout design. You decide on the number of tables, the layout, fonts, colours, images and any other finer details you would like including and we can supply a personalised individual quotation. And we keep you up to speed with the overall design with mock proof images of the finished item so you know exactly what you are purchasing and that all of the details are correct.